"When on Music's mighty pinion souls of men to heaven rise/Then doth vanish earth'sdominion; Man is native to the skies." Ludwig van Beethoven had been ruminating about a massive orchestral work, which would involve a choral finale, for many years before he did the ultimate in that area with the Ninth Symphony. In 1808, at the incredible concert which premiered the Fifth and Sixth Symphonies as well as other large scale works, Beethoven took a first stab at such a work and devised a Fantasia for chorus, orchestra and piano which was intended to end the concert on a triumphant note. Working from a libretto apparently written for him by Christoph Kuffner, Beethoven was overwhelmed and barely finished the orchestral and choral parts in time for the concert; he improvised the piano part at the keyboard himself. Having had inadequate rehearsal, the work collapsed in a horrific mess which humiliated both Beethoven and the orchestra. No such problems plague the recording of the Choral Fantasy, op. 80, on this disc. 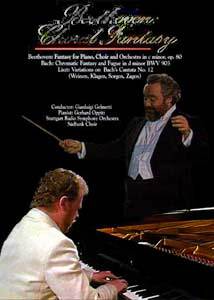 Pianist Gerhard Oppitz does a fine job in capturing the staggering wall of sound from the piano which opens the first few minutes of the Fantasy. The orchestra then comes in with a set of variations on a simple theme in C (which also prefigures the Ode to Joy in the Ninth Symphony), concluded with choral variations on the theme, ascending from conflict into harmony and from chaos into order. The main theme is now rather familiar, having appeared in a number of television commercials, but it is nonetheless affecting in its simplicity. I question Oppitz' choice of very slow tempo for the introduction; given the brief running time of the disc this might be considered padding of a sort. However, the balance of the Fantasy is taken at a more traditional and comfortable rate. Camera angles are numerous and varied enough to hold the viewer's interest, and we get more views of the pianist's hands than I've seen lately on concert discs. Following in the theme of Fantasy is J.S. Bach's Chromatic Fantasy and Fugue in D Minor BWV 903. This highly modern-sounding piece is quite complex and often daring in its harmonies. The lengthy fugue subject (eight measures in all) is intriguing and Oppitz delicately emphasizes its presence throughout without becoming overbearing. Rounding out the package is Franz Liszt's Variations on Bach's Cantata No. 12 (Weinen, Klagen, Sorgen, Zagen). This piece ties the Bach into the Choral Fantasy by taking a choral work with a chromatic basis and setting it to variations which are often intriguing and at times maddeningly difficult; through parts of the work Oppitz' hands are hardly visible in their frantic motion (Oppitz is clearly bathed in sweat just a few minutes into the piece). At the same time, Liszt takes the simple descending chromatic figure and by decoration makes it a cry of grief and agony (the piece was written upon the death of one of Liszt's daughters, in an unintentionally ironic comment on the lyrics of the chorale, "That which God does, is done well"), which Oppitz captures wonderfully. The variations in their anguish can be difficult listening; the whole is quite moving indeed. Oppitz does have a tendency to overpedal at times, making for the occasionally blurred phrase. However, overall there is little to complain about here at all. While the choice of selections for this concert is certainly inspired, it's too bad that some more such pieces couldn't be found; at a running time under 52 minutes, including applause and credits, this disc is likely to disappoint in terms of duration and hence the Substance grade is lowered from the A it would otherwise merit. Image Transfer Review: These live performances have good blacks and very good shadow detail. There are some focus issues throughout; while at some times the definition is clear and crisp, at others it is quite soft and indistinct. It should be noted that Oppitz seems to have a very ruddy complexion naturally; none of the other participants have such a reddish appearance, so this does not seem to be a transfer fault. Color is in general quite good, although the palette is naturally limited. Backgrounds are steady in appearance and not subject to flicker. Audio Transfer Review: The PCM audio track is quite pleasing throughout, with a natural-sounding mix. Both it and the DD track suffer from occasional microphone noises; if these can be eliminated in audio recordings I don't understand why engineers leave them in on DVD releases. The 5.1 track is rather a disappointment; mixed far too loud for starters, it tends to suffer from distortion in louder passages. The orchestra tends to be in all speakers and the piano primarily in the front, leading to a slightly confused soundstage on this track. The orchestra is fighting a losing battle with the piano on the 5.1 audio, since there seem to be too few mikes spread amongst the orchestra. During the softer passages on the Choral Fantasy, the melody in the flutes and oboes tends to get drowned out by the accompanying passages in the piano. The pizzacatos in the violins sound harsh and rather nasty as well. Do yourself a favor and stick with the PCM audio. The DD track garners about a D; the stated grade is for the PCM. Extras Review: At the head of the list of extras is another of the typically excellent musical analyses that we are finding on more Pioneer classical music DVDs. This one in particular does a very nice job of pointing out figures which will become important later on; on the Liszt the grounding motif is located for the listener in the analysis, which is helpful in keeping the structure in place. Bios of two screens each are provided for Oppitz, Gelmatti and the orchestra. We also get an 11- screen glossary of musical terms, a list of historical and cultural events which happened in the years that these works were composed (1720, 1808 and 1862) and a listing of other Pioneer discs. There are also English subtitles presented for the choral portions of the Beethoven, which is handy; it would be even better if one could see both the subtitles and the musical analysis at once, but I suppose that there's only so much room on the screen. The chaptering is peculiar; the Beethoven should have at least 3 chapters, with a stop at the orchestral entrance and at the chorus' entrance. Instead, it appears that there is supposed to be only one chapter devoted to this lengthy work, and a second chapter stop has been dropped (apparently unintentionally) in the middle of the coda. A stop is devoted to each of the fantasy and fugue in the Bach. A very good performance, hampered a little by improper miking of the orchestra and a less than happy 5.1 track, with an excellent musical analysis. Very brief, however, for the price. Mark Zimmer is Project Director for The Unheard Beethoven, a nonprofit website devoted to making MIDI sound files of the unrecorded works of Ludwig van Beethoven available to the public. Among other items on that site, listeners may download a sound file of Beethoven's discarded orchestral introduction to the Choral Fantasy.